The last year was another milestone in the era of online custom jewelry. 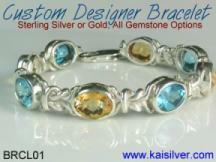 And once again, Kaisilver stole the limelight with high end custom made jewelry that was second to none. While we consolidated our position as the world's topmost provider for high end Claddagh rings, we also hit new highs in high end male gemstone rings. With an ever growing thirst for high quality custom gemstone jewelry, you are bound to hear more about us in the coming years. High end craftsmanship, flawless handfinishing, hand picked and custom cut gemstones are some of the reasons why over 5,000 jewelry lovers, spread across 19 nations, rely on Kaisilver for good quality gemstones and jewelry. Since all our jewelry is custom made, you can request for any design modifications that you need. 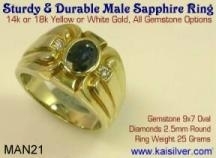 You also have the opportunity to select the gemstone of your choice and choose from 14k or 18k white or yellow gold. 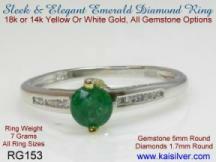 Write to us at sales@kaisilver.com for all your jewelry and gemstone requirements. Your queries are answered by experienced craftsmen and jewelry designers. You will not be pressurized into rushing to finalize your order by smart talking sales persons, the reason is because, we do not hire sales staff. 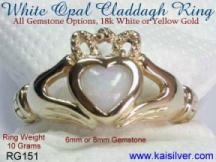 We realize that your queries need professional jewelry expertise and not fancy advertising and sales gimmicks. 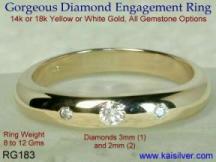 We specialise in high end custom jewelry and you can even send us, images of your favourite designs to be custom made. 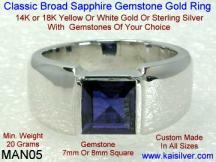 Why Buy Custom Jewelry From Kaisilver? 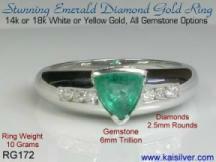 The Name You Can Trust: Kaisilver is the world's largest online provider of high end custom jewelry. Our buyers include fashion models, news readers, hotel and resort owners, members of the U.S and U.K armed forces, business professionals and doctors. We are directly networked to all the leading gemstone producers in over 15 nations. Over 3,500 skilled craftsmen and 5 of the best designers work on all Kaisilver orders. Click Here to read some of our buyer testimonials. High End Craftsmanship: Our custom gemstone jewelry is not mass produced. Every jewel is individually attended to by very skilled craftsmen under the watchful eyes of our designers. Great attention is paid to even the smallest detail and flawless handfinishing is provided in the final phase of production. The process is time consuming, but this is the only way to create high end custom jewelry. Strict quality control checks are put into place at every stage. No compromise is made and even the smallest flaws are not tolerated. Well Researched Designs: Most jewellers create designs that appeal to the mass market without caring much for durability and long term benefits to the buyer. At Kaisilver, our designs are researched by a team of designers and craftsmen and great care is taken to increase the long term durability of our custom jewelry. For example, our male rings are designed after a thorough study of the lifestyle and habits of modern men. 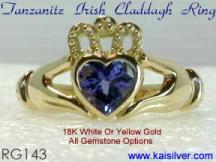 The Claddagh tradition was studied for over three months before we created the design for our Claddagh rings. 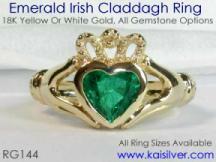 Care was taken to retain all the elements of the original Claddagh ring. 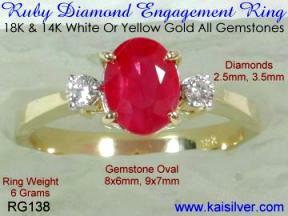 Complete Gold Choice: All Kaisilver custom gemstone jewelry can be ordered in 14k or 18k gold. In some cases we strongly recommend 14k gold because of it's hardness. 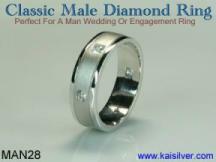 A good example is for male gold rings where durability is of prime importance. You can also select white or yellow gold for your custom jewelry and the two tone gold option is available at no extra charge. In the two tone gold option a combination of yellow gold and white gold is used in the same jewel. Gemstones Of Your Choice: With direct and preferential access to over 200 million carats of gemstones, we offer you a virtually unlimited choice of gemstones. 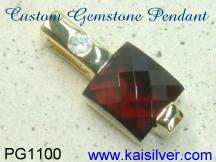 All custom jewelry can be made with gemstones of your choice. 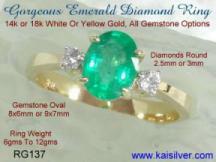 Just let us know if you need a gemstone not mentioned on our website and we will procure it for you. Every gemstone is hand picked by experts and custom cut. All Design Modifications: Since all our custom made jewelry is given individual attention by skilled craftsmen, all design modifications are possible. 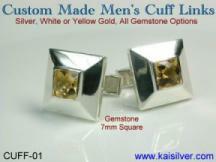 The high end custom jewelry from Kaisilver relies on a lot of handwork and is not mass produced. You can even send us images of your favourite designs to be custom made. 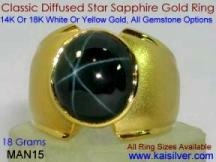 Combined with the complete gold choice and an endless range of gemstone options, Kaisilver custom jewelry provides a degree of flexibility that is unmatched on the Internet or at conventional jewelry shops. Long Term Durability: Few jewellers pay attention to the issue of long term durability when designing custom jewelry. 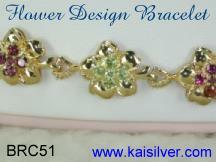 At Kaisilver we realise that buyers pay a premium price for unique custom jewelry and therefore expect good quality. Our quest for better quality and durability starts with the design of the jewel itself. Every design is researched by a team of expert designers and craftsmen. The type of gemstone mounting, the finishing at the edges and rim of the jewel are all given the attention that they deserve. Male rings are made keeping in mind the active lifestyle of modern men, emphasis is on durability but style and craftsmanship are not compromised. 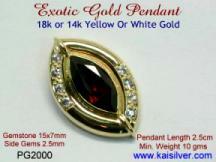 The good gold weight of all Kaisilver custom jewelry ensures that the jewels do not bend and twist at the slightest excuse. 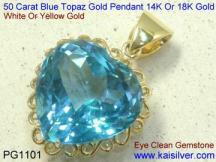 The gemstone mountings are firm and solid with the added gold content. Prong settings are avoided in most cases and we border the entire gemstone with gold, this ensures that the gemstone does not loosen with time. The gold border also protects the gemstones from side impact. Prong settings if at all used, are designed with solid prongs to increase durability. Prongs tend to stick in pockets and other places. This causes them to gradually open up and loosen the gemstone. We recommend 14k gold for it's hardness when prong settings are provided in a design. 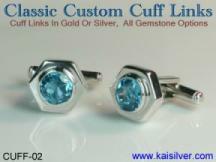 Click Here for a complete report on Kaisilver custom jewelry value and you will realise why cheap jewelry is cheap only in the short term. 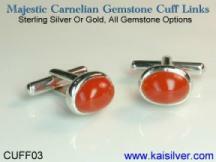 The Best Jewelry Newsletter: Kaisilver provides you with the best selection of gemstone and jewelry information. Our custom jewelry newsletter covers issues and topics that other jewellers would not dare to reveal. Information is provided in a simple, straightforward and non-technical format. Click Here to read and subscribe to our newsletter. We believe that allowing you to make a well informed decision gives you best value for your money. We are considered more than just another jeweller and have always been on your side. First of all select the design that interests you and make a note of the item code mentioned on the image. Remember that you can ask for any design modification that you need and also send us images of your favourite designs to be custom made. Provide us with information regarding the gemstone that you prefer and also the ring size and other related information. 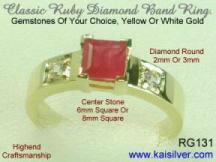 You can also select 14k or 18k yellow or white gold for your custom gemstone jewelry. 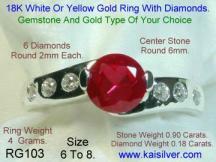 Email us the above information at sales@kaisilver.com and we will get back to you with the pricing and other details. Your emails are answered by a team of professional designers and craftsmen. We do not hire smart talking sales staff to pressurize you into finalising the order. You can take your time and get all your queries and doubts cleared before making a decision. It is in our interest as well as yours that, you make a well informed decision. Once we have finalised your requirements and worked together on a final price, you can proceed to the payment phase. 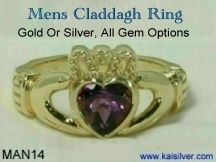 We accept payments through paypal and you can register for a free paypal account at http://www.paypal.com our email for paypal is info@kaisilver.com and we are International Verified Premium Account holders of paypal. You can therefore transact with confidence. We also accept payment through International Money Orders in U.S$ and can provide details for this mode of payment, on request. Let us know if you prefer Western Union Money Transfer and we will email you with details for the same. In most cases, your bank can help you with Money Orders and Western Union Money Transfers. The shipping charge is 25 U.S$ worldwide and we can ship through FEDEX or EMS with web tracking. Shipping is done within 3 to 4 weeks of order confirmation and receipt of payment. We need this time due to the individual attention provided for every single jewel. We do not indulge in mass production and always provide the finest craftsmanship that you can find in custom jewelry. 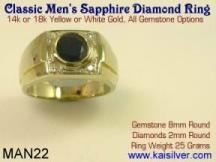 All gemstones are hand picked and custom cut, no close out and reject quality gimmicks are played at Kaisilver. We will not compromise on quality and rush the production process inorder to get your order. 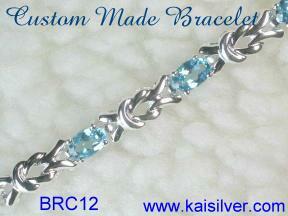 The best way to get your Kaisilver custom jewelry on time is to order it well in advance. 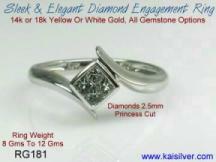 Kaisilver.......bringing back the human touch to online selling.